Big cities, Maori culture, fun, beaches, adventure activities, awesome wildlife experiences, adventurous Queenstown and stunning landscapes – this tour offers a comprehensive exploration of New Zealand where you will discover the best of what this country has to offer. Kia Ora! Good to have you aboard the North Island Tour! Known as the City of Sails, Auckland is a melting pot of South Pacific and Asian cultures and a strong Maori heritage. This diversity brings with it an abundance of unique dining and shopping experiences. Today you can experience many attractions and adventure activities on offer. Today is truly action-packed. Those who do not book any of the additional activities will go on a tour of the city, explore the famous Auckland waterfront and may go to the outlet stores and the inner city shopping area. 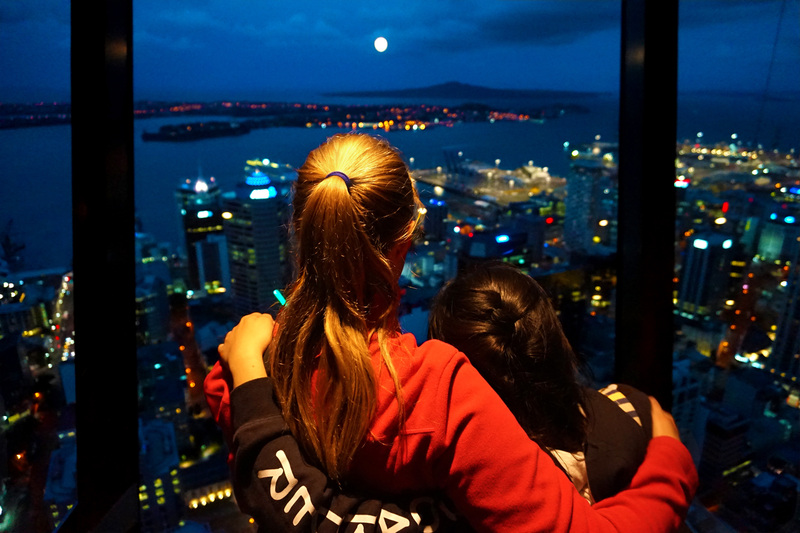 In the evening our guide will take you for a visit up the Skytower at 328 metres high, a truly breathtaking experience with awesome views over Auckland at night. Our journey continues to Whitianga, the main settlement of Mercury Bay, a great little seaside town with a deepwater harbour. The area, called Coromandel, is one of quite stunning beaches and bays and home to Hot Water Beach, so named because of the hot springs which surface on the sand two hours either side of low tide. If the tides allow we will take a spade and dig our own hot pool. In the late afternoon, everyone gets the unique opportunity to participate in a bone carving workshop. You will produce your very own high-quality personal souvenir of your visit to Whitianga and take it home with you. In the morning you have the opportunity to book a kayak trip in Whitianga. In the afternoon our journey continues to Rotorua, famous for its thermal mud pools and Maori history and culture. We will spend the whole day in Rotorua, known as the thermal wonderland of New Zealand. Its hot springs and geysers have attracted people for over a hundred years. Rotorua sits on the shores of Lake Rotorua and is built over a geothermal hot spot. There are numerous natural vents, hot pools and other geothermal features in and around the city. 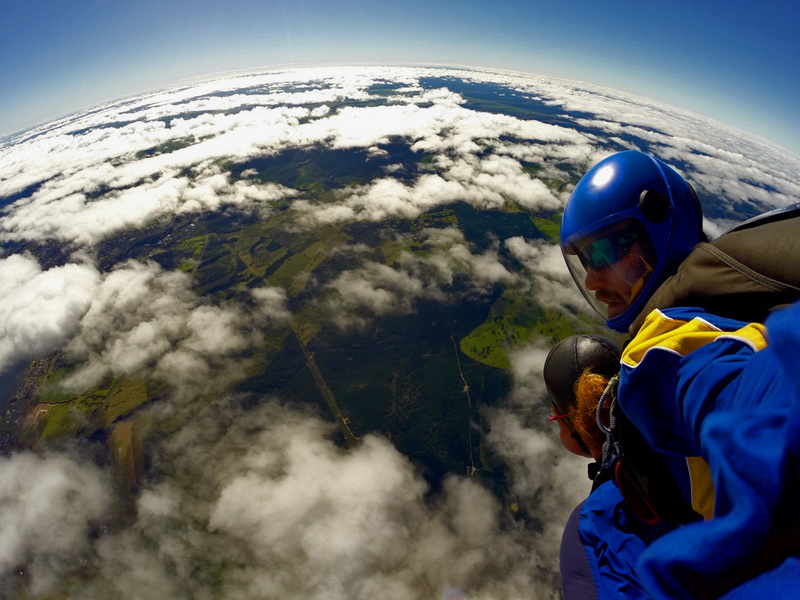 But Rotorua is also known as the adventure capital of the North Island: White Water Rafting, Skydiving, ZORBING,… Rotorua offers something for every taste. If you a fan of Lord of the Rings, use the day to discover “Hobbiton”, the film set where parts of the movies where made. In the evening you will have the opportunity to find out more about New Zealand’s indigenous people, the Maori, when we visit a traditional Pa (Maori village). You will hear about their history and learn about their culture. Traditions such as the Powhiri (formal welcome), the Haka (war dance) and a delicious Hangi (traditionally earth-cooked Maori feast) will turn this evening into an unforgettable experience. Leave Rotorua to head south to visit Lake Taupo, New Zealand’s largest lake. We will stop to see the famous Huka Falls before the journey continues to Wellington. On our way, we might even be able to catch a glimpse of some of the volcanoes located in the central North Island. The Tongariro volcano still smokes, the ancestral fires still burn and the land lives on for all. Tongariro, Ngauruhoe and Ruapehu have all erupted in recent times. Having arrived in the “Coolest little capital in the world” – rated as such by Lonely Planet Travel Guides – you have time to explore the city. Visit some of Wellington’s shops – after all, the town is very popular among Kiwis for its shopping – or take a stroll along the harbour and stop in one of Wellington’s many excellent cafes. In the evening, we will have a farewell dinner. In the morning, we will explore Te Papa, New Zealand’s fantastic National Museum and then will have some free time to go souvenir shopping. Sadly today is our last day as you head back the airport to fly to your home destination in the afternoon. Kia Ora! Good to have you aboard the South Island Experience Tour! Sit back and relax while we drive you South towards the Southern Alps. We stop in Murchison for lunch and continue our way to Hanmer Springs on the famous Lewis Pass. “Hanmer” – as the locals call the town located between snow covered mountains in Northern Canterbury – is one of the top spots for hot pools and thermal springs in New Zealand. Here, you have the chance to join an amazing Alpine Horse Safari, try out clay shooting or just simply chill out in the thermal spa pools! We have a relaxing evening playing games in our very own lodge and getting to know each other. 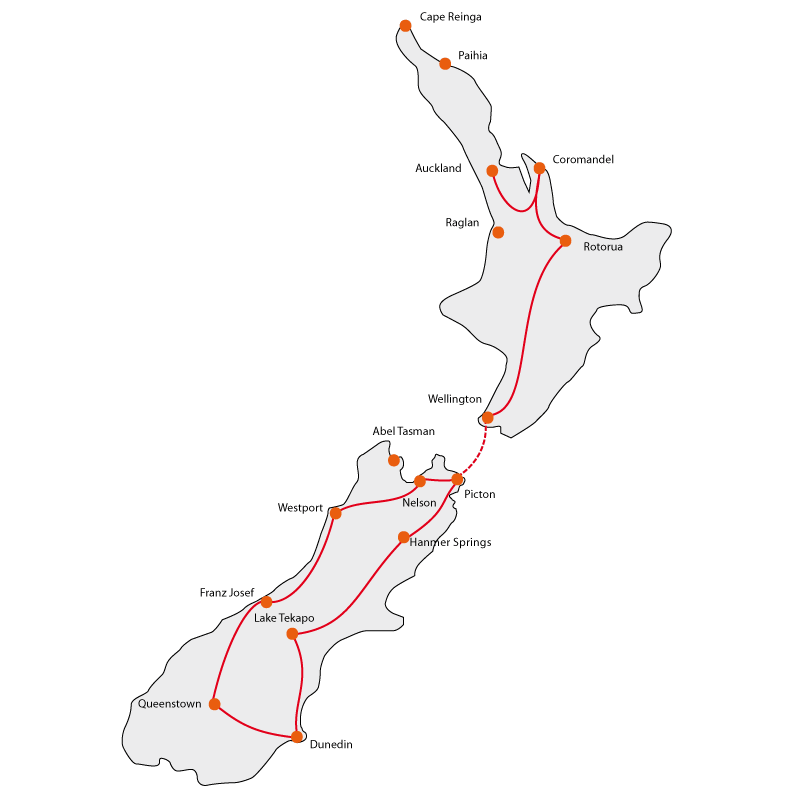 We leave Hanmer Springs in the morning and continue our journey down south along the East Coast. We stop in Christchurch for lunch break and you have the opportunity to do some shopping in New Zealand’s second-largest city. Have a walk through the colourfull container mall! In the afternoon we drive you to our destination for today: the picturesque turquoise coloured Lake Tekapo. Dazzling by night, Lake Tekapo is the perfect spot for stargazing. Don’t forget to take a picture with the famous Church of the Good Shepherd in the background. The stunning lake is understandably a popular theme for postcards. We leave the turquoise lake in the morning, stop at Lake Pukaki, another spot for breathtaking pictures of the lake with Mt. Cook in the background. 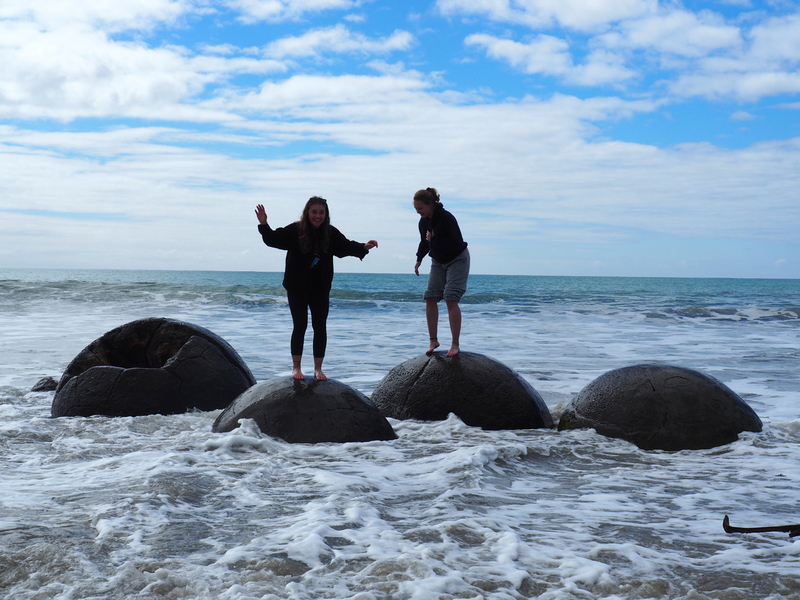 We drive through the cosy little town Twizel and stop at the famous Moeraki Boulders. 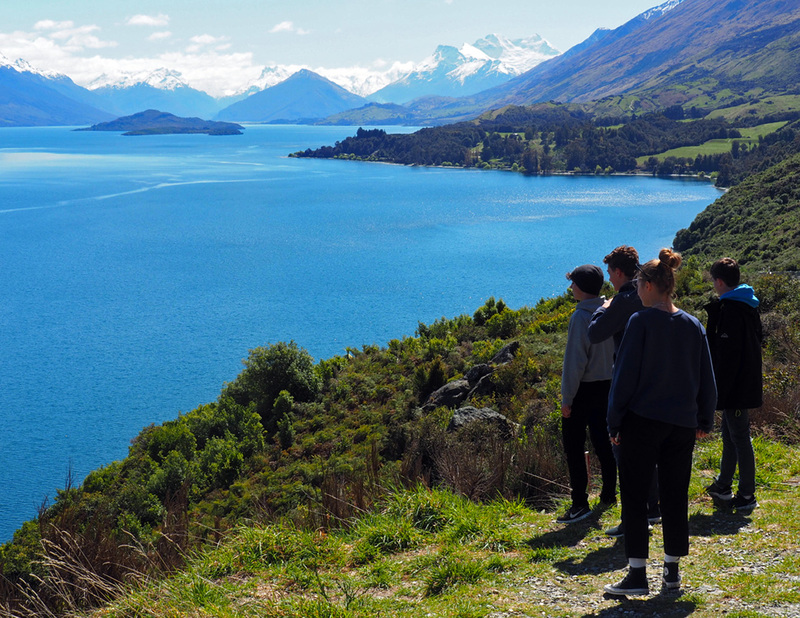 Take fantastic photos with your friends as this spot is one of the must-do’s in New Zealand. Then we continue our drive to New Zealand’s most famous university town – Dunedin. Students make up one-fifth of the population so it’s no wonder that the city is hailed to have a great atmosphere. On the way to Dunedin we travel through the stunning area of central Otago, along lakes and hydro dams and through fertile horticulture country with many fruit orchards along the way. 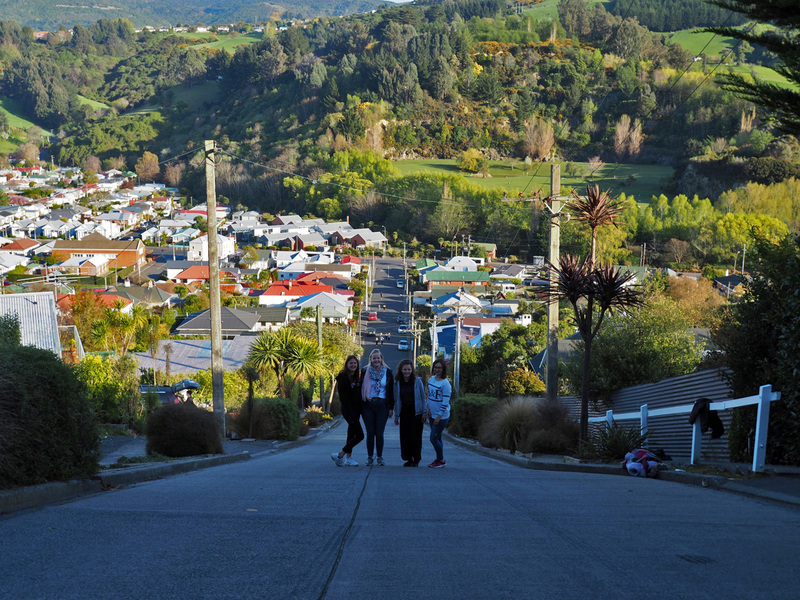 Having arrived in Dunedin, we will definitely visit Baldwin Street, the worlds’ steepest street – see who can reach the top of the street fastest. In the afternoon you have the chance to explore Otago Peninsula on the Elm Wildlife Tour, an eco-experience on which you can see penguins, fur seal colonies and the famous albatross birds. If you choose not to go on the Elm Wildlife tour, there are plenty of other things to do in Dunedin: go shopping, visit the Otago Museum to explore the history of New Zealand and the Southern Hemisphere, check out the Dunedin Public Art Gallery, one of New Zealand finest art museums. To top it all off, a visit to the famous Cadbury Chocolate Factory with lots of opportunities to taste different chocolates could be on the programme for those of you who have a “sweet tooth”. Today is the day all you thrill-seekers and adrenalin-junkies have been longing for – we head off to the birth place of bungy jumping. Queenstown is known as the adventure capital of New Zealand, if not the world. After checking into our hostel in Queenstown, we will take the Skyline Gondola up to Bob’s Peak. This is the steepest gondola in the southern hemisphere and from the top of the mountain, you have an awesome view over Queenstown, Lake Wakatipu and the mighty Remarkables mountain range. We will enjoy a traditional & powerful Maori Haka performance, followed by an original Kiwi buffet dinner. A truly unique New Zealand experience! Jump off a bridge, swing over a canyon, paddle your way through a raging river – there’s nothing you can’t do (as long as you have permission from your parents of course ). For the more faint-hearted there are stunning cruises to Milford or Doubtful Sound that are sure to inspire. Those of you that do not book any of the extra adventure activities have a chance to explore Queenstown. We will go for walk into town, do some sightseeing and shopping, and we take a walk along famous Lake Wakatipu. Tonight is free time for everyone, take a stroll into town or spend time to look at the fantastic photos everyone has made and update your Facebook pages. Another free day to continue your adrenalin rush. For those of you who do not book any extra activities today there is lots to do and see in Queenstown. Go and check out the world famous Fergburger for lunch or enjoy a coffee on the shore of Lake Wakatipu. Tonight has a special treat in store for everyone. After dinner we head along to the ‘Minus 5 Ice Bar’ for a non-alcoholic cocktail. The bar is made completely of ice, even your cocktail glasses. But you do not have to freeze, you will be given warm clothes and gloves, so you can enjoy your experience in comfort and marvel at the great ice sculptures at the bar. We leave Queenstown in the morning and stop in Arrowtown, a Wild-West like village where scenes of the movie Lord of the Rings were filmed. We continue our way up north and stop in Wanaka for lunch. Heading to the wild West Coast through the Haast Pass. Here we have the opportunity to get close to some of the Haast Pass natural wonders, like blue pools and waterfalls. In the evening we reach one of the world’s most accessible glaciers, the Franz Josef Glacier. Franz Josef Glacier was named after the Austrian Emperor Franz Josef and is one of only three glaciers worldwide that borders a rain forest. In the evening you get the chance to relax in the cozy hostel. 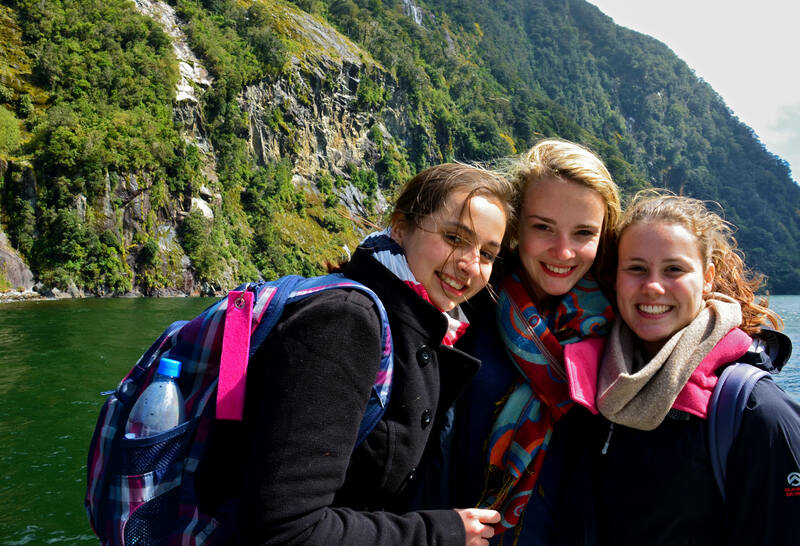 We spend the morning in Franz Josef and you can join some exciting activities. It’s up to you how you want to explore the Franz Josef Glacier. You can choose one of the extra activities recommended below, or join our tour guide for a walk through the valley and up to a glacier viewpoint. In the afternoon we make our way north through Hokitika and Greymouth along the wild West Coast. We stop in Punakaiki, visit the famous Pancake Rocks which really live up to their name and stop for a quick walk on Truman Track into the Paparoa National Park. Then we continue our journey towards Westport. After days packed with activities, we will enjoy a last evening together at the hostel, tell the best stories of the tour and finish off with a Farewell dinner. 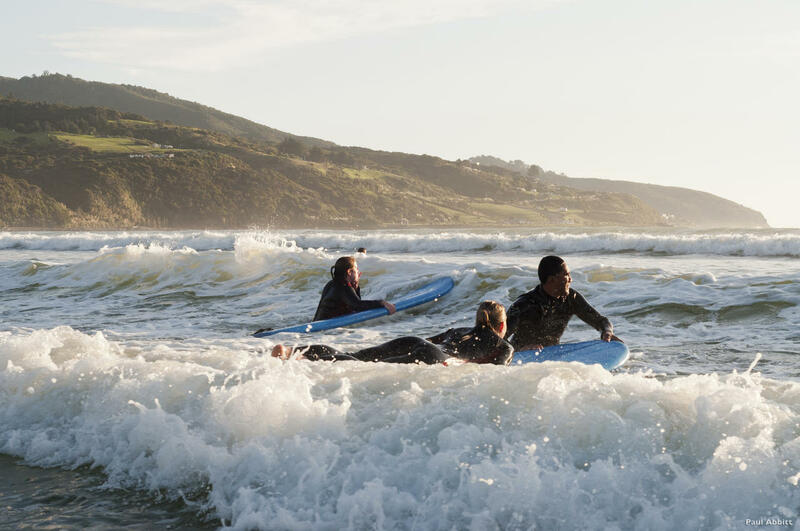 In the morning you have a chance to try surfing or paddle boarding in Westport or relax at the beach. After your activities, we leave Westport and begin our return journey home. Sadly, we have to say goodbye in Nelson, but we’re sure you’ll never forget this experience – so keep in touch! Guided add-on option to Nelson: Transport from Wellington – Nelson for NZ$145: If you live in Nelson, you can book our guided add-on transport option from Wellington to Nelson. This includes a scenic ferry ride from Wellington to Picton over the Cook Straight and through the beautiful Marlborough Sounds. Having arrived back on the South Island, a bus from Picton to Nelson will be arranged.